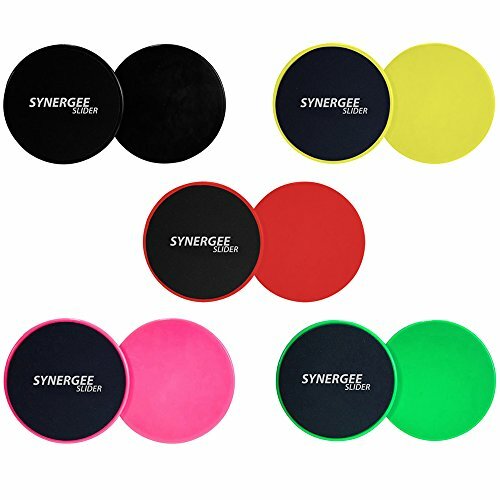 In terms of simplicity, the Synergee Core Sliders are one of the smallest, inexpensive pieces of exercise equipment available. These small discs can broaden your range of exercises while reducing your risk of injury. If you are looking for core toning exercises, you may have found your secret weapon. Incorporate Synergee Core Slider exercises into your workout for a safe and effective change of pace. If you have had any sort of injuries or soreness, which most people have, the slider is an effective tool to help you reduce your aches and pains.
? LOW IMPACT - These small discs can broaden your range of exercises while reducing your risk of injury. If you are looking for core toning exercises, you may have found your secret weapon. The smooth side works on carpet and the fabric side works on hardwood or tile floors. ? ENGAGES CORE - Synergee Core Sliders engage your core muscles throughout the full range of motion of an exercise while introducing a balance challenge. The long, graceful movements are also a good way to increase flexibility. ? COMPACT - The beauty of Synergee Core Sliders is you can use them in a variety of different workouts - an aerobic or dance workout, Pilates, muscle shaping and strengthening moves and even yoga. Just as importantly, they're fun! ? STRENGTHEN AND CONDITION - Since your hands or feet remain in constant contact with the surface, Synergee Core Sliders provide low-impact weight-bearing exercise. Synergee Core Sliders measure 7"x7"x.05" ? ALL AROUND PROTECTION - Buy with confidence knowing that no matter what, we've got your back! We offer a better than money back guarantee, if there is an issue with your product for any reason we will refund you and send you a new one absolutely FREE! We stand by our products and only manufacture the absolute BEST!